Gymnastics instructional videos are great for helping you practice your gymnastics at home. These videos are great for older gymnasts and parents. They have ideas on ways to practice your gymnastics at home and for maximizing your time at the gym. I highly recommend you purchase a couple videos with your home gymnastics equipment, to get the best use out of it. These are great to help take gymnasts to the next level! Steve Nunno is a two-time Olympic coach and one of the most successful gymnastics coaches in the US. In this beginner gymnastics video he takes you through skill and progressions on each of the events. This is a great video for parents to better understand the sport and some of the skills gymnasts learn in gymnastics class. This is also a great video for parents to watch when they first purchase home gymnastics equipment to help beginner gymnasts figure out what to practice. Paul Hamm is the most accomplished male gymnast in United States history, and you can learn from him in this comprehensive three DVD set. This video set is great for both female and male gymnasts along with their parents. 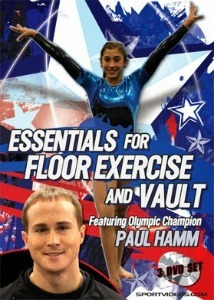 This is a great DVD for helping you figure out great exercises to practice at home to improve your gymnastics skills.